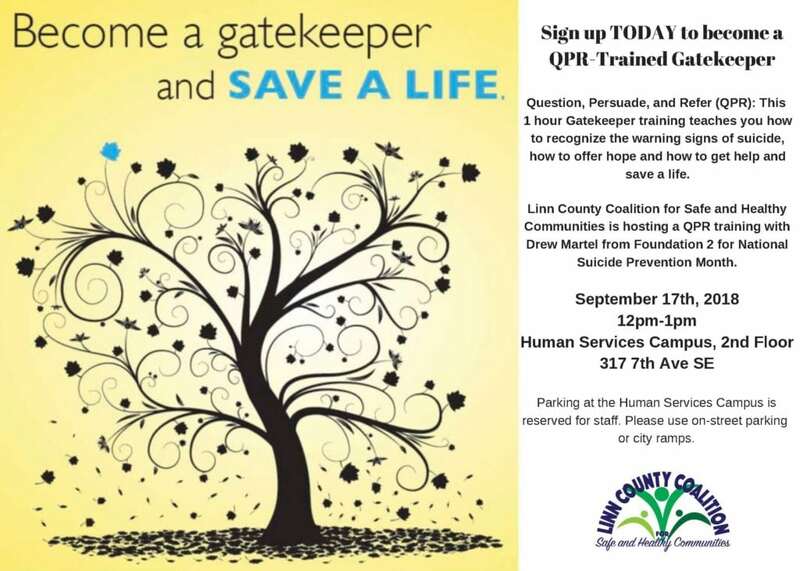 On Sept 17th at 12:00 in the Rex Eno Conference Room of the Human Services Campus, the Linn County Coalition for Safe and Healthy Communities is hosting a QPR training open to the public. Drew Martel, Foundation 2 Mobile Crisis Outreach Manager, will teach participants the warning signs of suicide, how to help someone with thoughts of suicide, and will provide information about community resources to assist someone in crisis. This is a one-hour training that is suitable for anyone in the public, regardless their current level of knowledge on the topic. Please note: Parking at the Human Services Campus is reserved for staff. Please use on-street parking or city ramps.